Nicole and I were in Aberdeen last weekend, the highlight of which was seeing Mogwai live at the Music Hall on Friday night. It was a great gig, with a mix of old favourites and some tracks from their forthcoming new album. 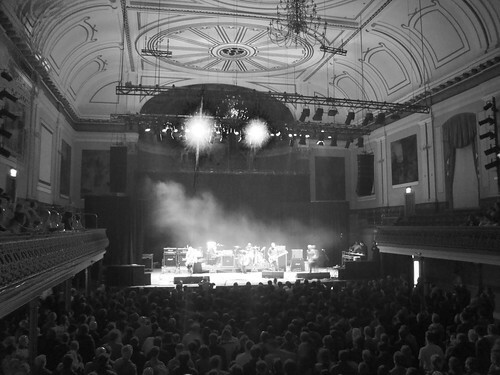 The venue is a grand old place, and with the seats up in the balcony being unrestricted it was possible to get a really wide perspective on the gig – not just literally in terms of the photo opportunities, but figuratively in terms of being able to take in not just the noise and the stage but the whole venue as well. Support came from The Twilight Sad, who I’d never heard before, and they were excellent – long, energetic, sweeping tracks of guitars, percussion and – a little oddly – saxophone. I’ll definitely check more of them out. Mogwai themselves were, as is their wont, loud. Very loud. Even being at the back of the venue there wasn’t much escape from the loudest excesses of the tracks, and while it sounded great, it did get a bit much; especially at the end when the ubiquitous and true-to-form fifteen minute wall of feedback came. Much as it’s good to go out with a bang, and the final track – annoyingly not Mogwai Fear Satan, the second time out of three that I’ve seen them miss out their classic gig finisher – was very good, the screeching feedback did come over a little self-indulgent, unoriginal and pointless. After a minute or two, they’d made their point, but they made it over and over again. I’m not complaining (much), though my eardrums took most of the following week to recover. The gig was great, the new tracks were good, and I’m definitely looking forward to getting the new album (which is out very soon). I’ve put a few photos here. Getting back to Inverness on Sunday with just forty minutes to change bags, it was straight off to Edinburgh for a couple of days’ work (and a pub quiz squeezed in on Monday night). I’ve not been travelling much for work so far this year, but I’m already in need of a bit of a break. Thank goodness for a four day weekend that starts today and will hopefully be productive on the writing front. Friday 4 February 2011 in Entertainment, Photography, Travel.